Our MA in Music and Culture provides inquiring students with a unique opportunity to explore various theories of culture, of music, and of music as culture. The program is grounded in the practices of various musics (classical, popular, non-Western) but conducted from a wide range of interdisciplinary theoretical approaches, including sociology, critical theory, feminism, post-colonialism, cultural studies and ethnomusicology. 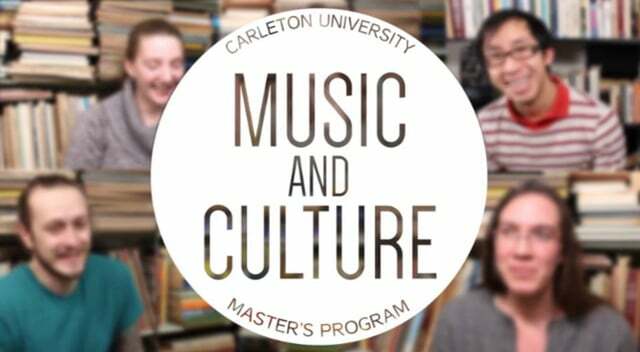 Carleton students can access an unparalleled number of music collections and year-round cultural activities and festivals in the nation’s capital that are relevant to our program such as as the National Arts Centre and the Canadian Museum of History. Moreover, the city’s large immigrant communities and diplomatic representatives from around the world provide a stimulating context for studying a diversity of musical cultures. To date, music students have been placed in numerous practicum settings around Ottawa, including Library and Archives Canada, the Encyclopedia of Music in Canada, the CBC, ChamberFest and Hummingbird Music/Pebble Studios.